Khadamat Waste Management Team manages and facilitates the collection of waste in the UAEU Maqam Campus. This service is an efficient, timely and compliant waste management service for the operational and environmental aspects of the Facilities. Khadamat Waste Management provides service for managing and undertaking the safe handling, transportation and disposal of waste from designated internal collection/storage points to its external point of final removal from the campus. Khadamat Waste Management comply with statutory standards and requirements, UAE law; and advises improvements, and assist in promoting a clean and tidy environment within the Facilities. In addition to routine waste collection, the services provide a reactive service via the Service Desk for waste collection and responds to such requests within the specified Service Response Times ensuring Service Standards are maintained at all times. Domestic waste – collected from each waste room and transferred to a Municipality’s skip for final disposal. Recyclable items – collected and consolidated and turned-over to an appointed recycling contractor for further processing. Pure Chemical Waste – collected upon receipt of completely filled up Waste Material Data Sheet along with the MSDS which reflect the revised government legislation, as dictated by the Centre of Waste Management (CWM). Mixture of Chemical Waste – collected upon receipt of completely filled up Waste Material Data Sheet as per Khadamat agreement with the University in line the government regulation. Other Hazardous Waste – collected upon receipt of a completely filled up Laboratory Waste Collection Request Form. Waste Management teams collects waste once daily, Sunday through to Thursday (8:00 am to 5:00 pm). A limited service shall operate on Saturday, and out of semester periods. UAEU personnel/designated laboratory specialist manages the containment and clean up of chemical spills. Khadamat Waste Management Team will collect used chemical spill kit, considered to be hazardous materials, upon collection request logged to the Service Desk. Please refer to process flowchart in this link (Chemical Spill Clean Protocol) for reference. To request for this service or for more information you may contact the Khadamat Service Desk at 03-7138000 or servicedesk@khadamat.ae. UAEU personnel/designated laboratory specialist manages the neutralization and clean up of Mercury spills. 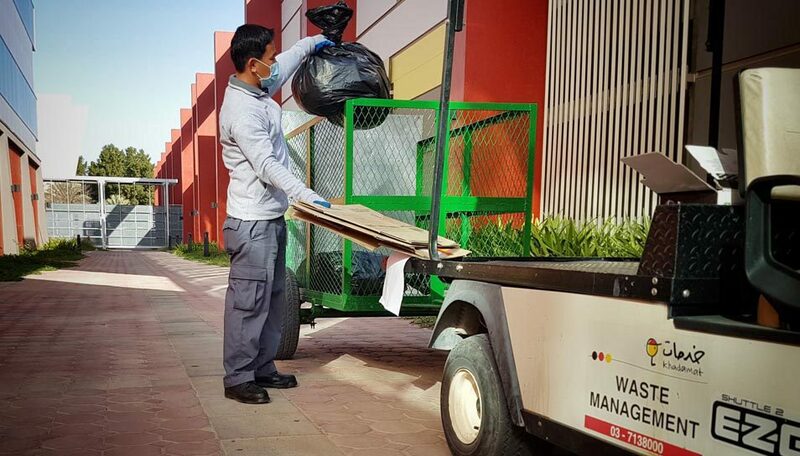 The UAEU’s Facilities Management Department (FMD) manages the collection of large waste items and may be contacted for assistance. For more information you may contact the Khadamat Service Desk at 03-7138000 or servicedesk@khadamat.ae.